We've done our homework! We have over 18 years experience working with schools and institutions. 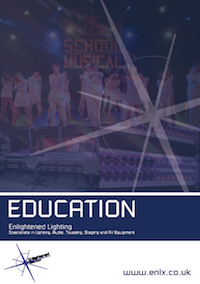 Whether you have a competent in-house technical crew, or are looking for full production support Enlightened can help. From a light bulb for your blown theatre lamp to helping you organise your party, summer ball, winter ball, graduation ball or event, our trained specialists are on hand to assist you. Full production of parties, balls, freshers’ weeks and other events including, lighting, sound, crew and event management. No event is too large or small, and the last thing we want to do is tread on toes. We will happily work with you to the extent in which you require us. Enlightened has a large range of equipment and expertise, check out our case studies to fully appreciate what we can do. You can view or download our education sector brochure opposite.